Cute, cute, cute!! Thank you for sharing! These are adorable and would work for anytime of the year. LOVE the deign of these. You decorated them beautifully. TFS. Wow These are super kewl. Great idea. Cute stuff -- I love the blue giraffe spot pattern paper! A present within a a present! Cute. I will try this. The gift card holder looks like a present. How cute! 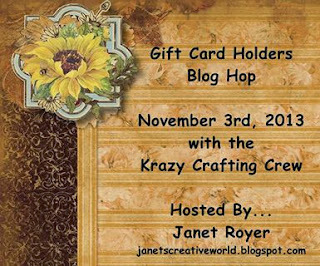 Your gift card holder is so cute! I absolutely LOVE this holder!.Its simplicity is GORGEOUS!! I loooooove your card holders....:) ! so cute !!! Love the idea of a gift card for holding a gift card. Pam, these are super cute. My favorite is the gift! Hope you are doing ok! Thinking of you! Sooo cute!!! I will have to look for this in the Sil store!!! Love the present. And if you leave off the bow it almost looks like a travel mug!! So Cute!!! Thanks so much for sharing. 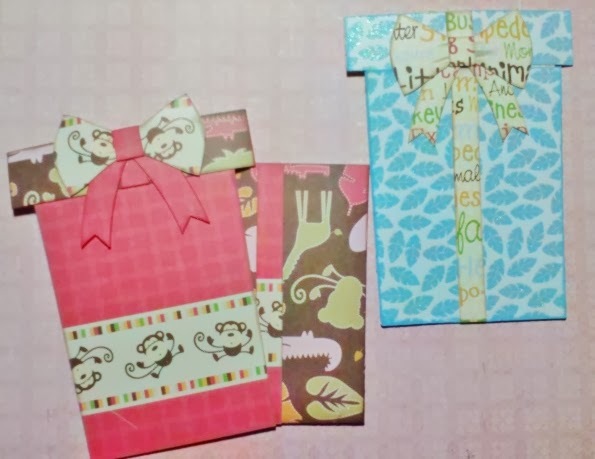 These are adorable--i like your choice of paper and the bow. I saw that at the sil store and almost made it! Papers sure look familiar! Great job, thanks for joining us. so cute! Love that they look like little gift boxes! and I have that cute animal paper too!